COMPASSIONATE CLIMATE ACTION: 53 Days - Climate Change and "Environmental Generational Amnesia"
53 Days - Climate Change and "Environmental Generational Amnesia"
• it hasn't affected us yet. than 80, they definitely remember a time when there were more butterflies, for example. And then so do I. When we tie this in with environmental generational amnesia, the loss of perception of change that occurs when each generation redefines what is "natural" or normal, we can see why the impacts of climate change in developed countries aren't registering for us. The impacts are still mostly gradual for us, and because we don't have an oral tradition of passing on natural history knowledge from one generation to another (thereby reminding each other and remembering together), subsequent generations just don't know what their bioregion used to be like. "[P]eople construct a conception of what is environmentally normal based on the natural world encountered in childhood. The crux is that with each ensuing generation, the amount of environmental degradation can increase, but each generation tends to take that degraded condition as the non-degraded condition, as the normal experience. That's what I'm calling the problem of environmental generational amnesia.... 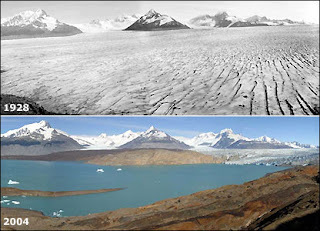 When people relocate and compare a degraded nature to a more degraded nature from where they came, the baseline shifts. But I think the baseline shifts most when it occurs across generations. For then an entire generation shifts its baseline downward." Intergenerational projects that bring seniors together with young learners should always include the middle-aged (teachers, parents, community members, archivists) as participants and learners, since they need to have their childhood memories jogged so that they can pass on the knowledge when the older generation passes on. In the meantime, I'm mourning the beautiful cedar trees in my community, which I swear have started dying just in the last few years. And so I'd better start pointing out some remaining healthy ones to my students, so that they'll have a memory of green and healthy cedar trees, rather than the orange and yellow they're turning now.